Huh. Interesting. I wonder if using it too much cuts down on your ability to recognize subtle ironies, though lol. What do you think of this, Rapha? Bad list. Vorstellung is so simple. Bref and on can be very easily translated, it just won't be an 100% dynamic translation. Hellhörig is very singular, but it doesn't hold a complex concept, so it can be paraphrased. Pan(i) is just classic T-V distinction, which is usually ignored in translating to English. It's funny to know, however, that tertulia (in Portuguese, tertúlia) is such an exclusive Iberian concept. Yeah, I would just render Pan(i) as "sir/ma'am" or "m'lord/lady." The confusion over Vorstellung makes me think of other German etymologies like "verstehen" or "es gibt" (I feel like Heidegger's Existentialism could only really have been concocted by a German speaker lol), but those aren't really translation issues per se. Nunch'i would probably best be rendered as "reading the room" or "empathizing" or something. A santiguadora sounds to me like the Medieval British idea of the Bedesman (with a bit of influence from generalized "witch woman" practices). But I guess that wouldn't be any clearer to the average reader. What bothers me most about the article is that these words are from Man Booker nominees, but maybe they were just throwing something out there half-heartedly when they were busy doing a million other things at the same time. I don't know. So what would be your picks for really hard to translate words? Sometimes it's just "you". T-V distinction is an interesting thing in Portuguese. Europeans and Africans have a very simply T-V distinction in singular ("tu"/"você"), but none in plural (only "você"), but some dialects in northern Portugal preserved it for plural ("vós"/"você"). Many Brazilian dialects loss "tu", and the ones that kept it, kept it as an extremely informal pronoun (not just a T pronoun, but below that). Therefore, as soon as formal Brazilian Portuguese started to deviate from formal European Portuguese as a standard, we snipped "tu" from formal language. Eventually we started needing a V pronoun for very formal situations and started using "o senhor/a senhora/os senhores/as senhoras". This sounds ridiculously formal outside Brazil, but now we have a singular and plural V pronoun, but with usage less restrict than V pronouns in most languages. For that matter, many Brazilian dialects (including that of Rio) have a threeway distinction. We alternate between "tu" and "você" (or most usually the contraction "cê") among close family and friends (or when we want to be really rude), we use "você" (with less frequency for "cê") consistently with people we don't know, and "o/a(s) senhor(e/a)(s)" for bosses, elders, politicians, judges, etc. Yeah, Heidegger is particularly crafty for that matter. I would translate it to Portuguese as benzedeira, which is a similar office. They're still pretty strong in some regions, and Roman Catholic hierarchy often not only tolerates, but enforces their job. They're more like mystic healers than witches, though, some being pious Roman Catholics. My ex, who was born in the outskirts of a 3k-people town, was delivered by a benzedeira. "Saudade" is often described as an extremely difficult concept to convey outside Portuguese language, but its overall meaning can usually be conveyed by "missing/longing/nostalgia". I like "cafuné", which means fondling the top of the head. "Endomingado" isn't such a common word, but I like how it may mean either "dressed up as for Sunday mass" or "depressed because it's Sunday". From the top of my head, I recall tingo, a Rapa Nui verb meaning borrowing stuff until nothing is left. There's a book about untranslatable word with this title. There's some African language with a word for someone who always forgives two faults, but never three, and also a word in some Eskimo-Aleut language meaning constantly looking at the door to see if there are any guests. But I can't recall either. Ichwhay ialectday orfay ordsway atthay artstay ithway owelsvay? Ethay owelsvay uffixsay, Ayhay orhay/orway Ayway? Erethay isway/ishay away/ahay Igpay Atinlay eadthray erehay. Starting my journey into learning Spanish! Llámame si quieras charlar, amo practicar mi español. Call me if you want to chat, I love practicing my Spanish. I find the language extremely easy too, but since it's just bastardised Portuguese, it's easier for us. I found it easy as well, but I already had several years of French and Latin before then, so hardly a typical case. I can offer Bavarian, a German dialect which can be so strong as to be unintelligible by standard German speakers. Unfortunately, most of the youth no longer can speak it properly. I love Austro-Bavarian, it's my favourite German dialect! Very sad to hear from you that it has disappeared among youth. Are you aware if it's the same situation on Austria or the Bavarian countryside...? I'm even sadder by the loss of Low German, which is so unique and has such a long tradition. I can only offer fake Bavarian, like barely pronouncing "b/d/g", or putting a lot of "a" on words. It is somewhat better in Austria and rural Bavaria, still very much in decline. I can speak it really well, I think, but when I talk to my grandfather, I realize how much I have been influenced by English and standard German. Never thought about that, but indeed. Hū gǣþ hit mid þē? Rapha, you made my day! Awesome! Is there any good reason to learn an auxlang and/or interlang? I was thinking about Toki Pona since it's so quick to pick up, but it feels like it's still wasted effort that I could put towards learning a natural language. Toki Pona is nice to train your logical skills. I imagine the same can be said of Lojban or Ithkuil for very different reasons. Esperanto, however, is nowadays just a display of ultimate geekiness, although it had such strong political connotations decades ago. Yeah, that's what I was kind of thinking, myself. If I still had patience for useless languages (and by useless I mean those that don't give me access to new texts, media or people), I'd go for Ithkuil. Of course, as long as I wasn't too focused on Irish. Fun fact, not even Quijada is actually fluent in it. As for Irish, there's plenty of old texts to read and Irish TV shows you could watch it in. I'd like to learn it too someday, for the sake of getting back to my roots. Some Alaska Native language, I can't decide, maybe Tlingit. Wichita and Lashootseed also fascinate me as languages that almost completely lack labial sounds, but they're both super dead (I mean, so are Latin and Koine, but it's a bit different, isn't it?) I also don't know how well received a white boy trying to learn Native languages would be in general. "Speaking polish is unhealthy for your tongue and teeth﻿"
Serious? Joking? No idea lol! Another comment- "Even Saying "I love you" in Polish feels Like Killing someone ﻿"
It's about German, not Polish. Maybe Ich liebst du is a stab and Kocham cię is an axe chop, lol? 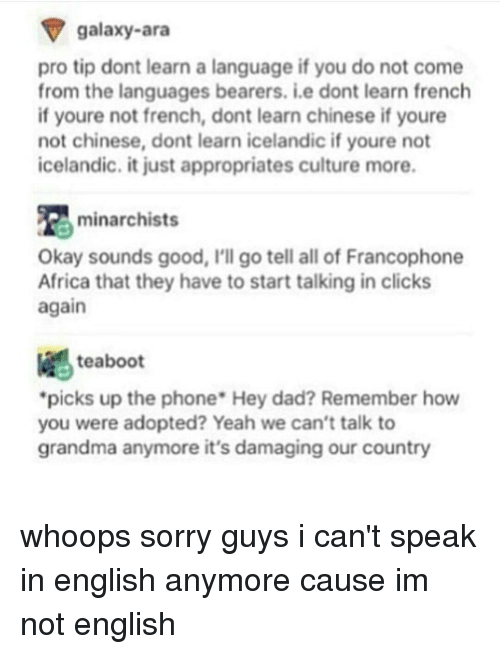 Native languages of Francophone Africa don't have clicks, but I'm sure this misses the point of the meme. Yeah, I hate it when somebody counters ignorance with ignorance (also, while Taa has 100+ clicks, none of them are all clicks). Beyond that, it was a good roast. Any Tanzanian fans of Return of the Jedi probably have a favorite character in Nien Nunb, the co-pilot of the Millennium Falcon that helps Lando Calrissian blow up the second Death Star, who spoke the language of the Haya people native to the east African country. It’s called Sullustese in the Star Wars universe. Kipsang Rotich, the Kenyan actor who voiced Nunb in the movie, became a minor celebrity in his home country after his voice was heard in what was then the final movie of the Star Wars saga. Rotich was recently tracked down to potentially voice Nunb again in The Force Awakens. Expect to hear some more Haya language in Star Wars again very soon. I admit to being uneasy with wholesale borrowing, even as I find myself taking inspiration from the (Wikipedia articles on) grammars and phonologies of various real world languages for my novel's conlang, like Tolkien did. At least it was Rotich's choice and he was well-received for it back home, I guess. Better than just using Quechua as Huttese because it's allegedly obscure (which it's not) lol. I'm forming sentence structures in Mixed English. People who speak Latin, would you ever use a mnemonic like this lol? To me it seems far more complicated than what it's trying to teach lol. No, it would make total mish-up in my head. However, I don't speak Latin, just know some things about it, as I had to study it for 2 years during theological studies. No because the song doesn't include the roots so you could mix up stuff in the future, but otherwise yes. BTW, that's a real problem in teaching dead languages. There was a lot of advancement in second language acquisition at least since Maximilian Berlitz, but people still teach Latin or Ancient Greek in a pretty... dead method. Indeed... Tables, tables and tables. Both for Latin and Koine in my experience. Plus some sentences from Bible or poetry. With the Biblical languages, learn them well enough to be dangerous on your own and then just use a lexicon. In addition to contemporary American English, I also speak fluent Coonass and can communicate to people who speak Delta Mumble. The only languages I still wish to learn are Mandarin Chinese, Modern Standard Arabic and Russian. There are many more I'd like to study, but I wouldn't really dedicate myself more than maybe browsing a grammar out of curiosity. Mandarin Chinese. Well, still learning it. Mandarin Chinese is pretty underrated considering it's the most spoken language in the world (albeit only in a few countries).